You don’t have to hide or show all the icons in your system trayâ€”you can control their disappearing acts. Right-click on the taskbar and select Properties. Click on the checkbox next to “Hide inactive icons” (if it’s not checked by default), then click on the Customize button. 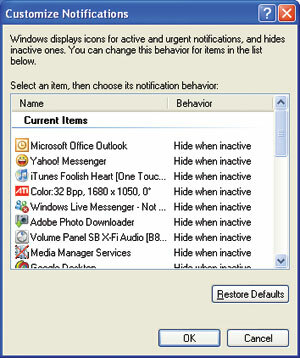 For each item on this list, you can choose “Hide when inactive,” “Always hide,” or “Always show” options to decide what you’ll see and when. You can prevent a lot of apps forcing Windows into chilled-molasses boot timesâ€”without uninstalling anything. Click Start, then “Run…,” and type msconfig. This brings up the System Configuration Utility window. Click on the Startup tab to see a list of all the apps slated to start when you boot up Windows. Click the check mark next to any you don’t want, and then click OK to save your choices. Whether you have trouble with your hands or you just prefer using the mouse, typing with Windows’ onscreen keyboard can be a great convenience. Navigate to Start > All Programs > Accessories > Accessibility, and click “On-Screen Keyboard.” Click OK to clear the dialogue box and then start “typing”â€”you can even change the settings to “press” keys just by hovering your mouse over the letter you want (enable this feature by selecting “Typing Mode” from the Settings menu). Don’t want to wait for your screen saver to kick in? Create a shortcut to it just as you would for any other program by hitting Windows key + F to search your computer and click on “All files and folders.” Type “*.scr” in the “All or part of the file name” field to find every screen saver file on your computer. In the resulting list, right-click and drag the screen saver you want to your desktop. Whenever you want it to start, just double-click its icon.